Beyond the tourist touts, sleazy bars and backpacker crowds, we reveal the peaceful and party-free parts of the island. North-west coast, adjacent to the Sirinath Marine National Park, 15 minutes by car from Phuket international airport. Flanking tranquil Mai Khao Beach, the JW Marriott Phuket offers traditional Thai pavilions and terraces with wraparound balconies sprawled across a tropical oasis. In 2011 Condé Nast Traveller readers voted it one of the top 20 resorts in Asia. Highly recommended is the award-winning Mandara Spa’s signature treatment, the Javanese Lulur ritual (a spice scrub, yoghurt-milk bath and floral oil massage). There are 252 rooms and 13 suites; add six restaurants, including the theatrical Kabuki Japanese dining room, five ‘chill lounges’ plus three enormous pools to the mix, and there’s already enough to indulge guests for days. But it’s the unique in-house activities, particularly for kids in the tricky ‘tweens’ that sets the resort apart from others: circus acrobat and trapeze instruction, traditional dancing, batik painting and Thai cooking classes to name a few. The blissfully undeveloped north-west coast, 20 minutes by car from Phuket international airport. The Renaissance Phuket Resort & Spa is nestled amongst vibrant gardens on the edge of a palm-fringed 17-kilometre stretch of sand. Its contemporary design is both minimal and luxurious, but in no sense precious. 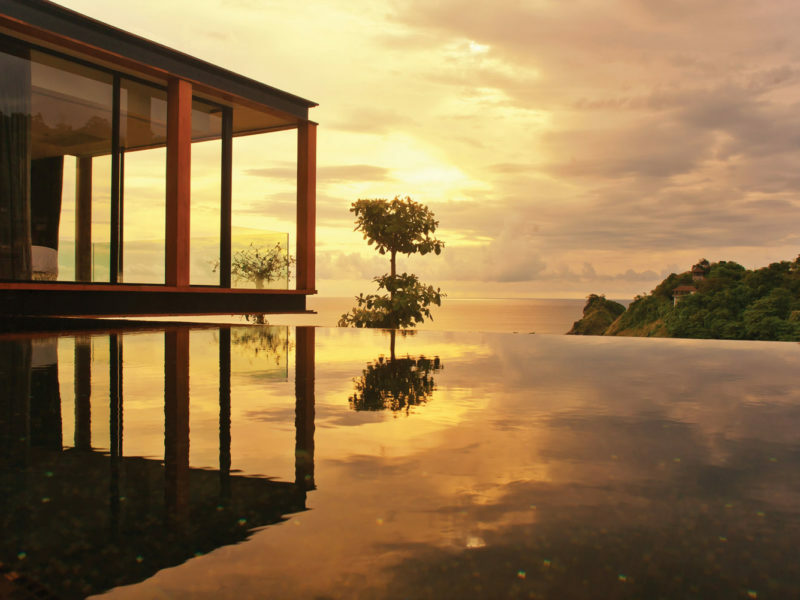 Tranquil: Renaissance Phuket Resort & Spa. The palate of blues and warm oranges complement the local woods, marble and glass used throughout the resort. Surrendering to relaxation, spa pampering and healthy eating is the resort’s mantra. That’s easy in the Ocean Front Pool Villas. Under curved sea turtle carapace roofs are spacious dwellings with up-to-the-minute mod cons opening onto private sun decks with jet-enforced plunge pools. With revived chakras, head barefoot to the sandy-floored poolside bar at sunset before dining aloft in the breezy Takieng restaurant to savour sour and salty Thai delicacies including Yum Pla Duk Foo (crispy sea bass with spicy green mango salad). On Racha Yai, a tiny island just off Phuket’s southern tip. It’s a 35-minute speedboat ride from Chalong Bay, which is a 50-minute drive from Phuket international airport. The Racha is a boho-licious playground set on the shores of a pristine beach lapped by luminescent waters. The 85 white-washed low-rise villas have crisp contemporary furnishings and dark wood accents – and some have private plunge pools. Lobby (and sea) view: The Racha, Phuket. The vibe here is one of pared down eco-chic for those seeking a remote island paradise and outdoor adventure. There are ample facilities including tennis and basketball courts, a yoga studio, gymnasium and a dive centre offering explorations off the island’s coral reef fringe teeming with marine life. Wind down in the Anumba Spa, immerse yourself in the beachside pool’s underwater music, and watch movies under the stars. This fantasy island sways to a tranquil beat. South-eastern tip of Phuket, approximately one hour by car from Phuket international airport. Tucked away on a former coconut plantation, the all-white Cape Panwa Hotel exudes a colonial charm. Sea facing suites and pool villas are settled amongst nodding palms and verdant greenery along the silky soft sands of Cape Panwa Beach. The protected alcove is great for swimming, windsurfing, catamaraning and canoeing, whilst snorkelling and scuba diving expeditions are scheduled daily to the reefs off nearby Coral Island. Island high: Cape Panwa Hotel, Phuket. With 11 dining and drinking venues, two swimming pools, fitness centre, day spa, badminton, table tennis and more, there’s plenty to satisfy families. Not to be missed is a beachfront Thai feast in the fairytale-like Sino-Portuguese mansion. Central west coast, 40 minutes by car from Phuket international airport. 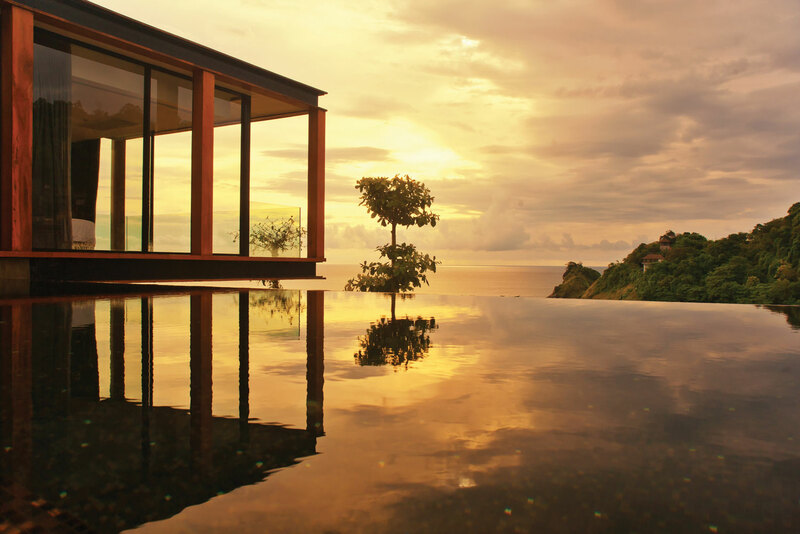 The Naka Phuket is an exclusive hideout. Its ultra modern treetop villas with glass façades cantilever down a hillside providing endless panoramas of the Andaman Sea. Discreetly integrated amongst lush vegetation, each is equipped with private pools and an outdoor bath and shower. The resort’s calling card is the accessible private beach at its base, and the picture-postcard outlook is best experienced from the comfort of the rooftop spa or during sunset tipples in the Meka Sky Bar. Though cocooned in a peaceful valley, The Naka is just twenty minutes by car to Phuket Town (if you can peel yourself away from the Olympic-sized infinity pool, and fresh market produce served in any three of the resort’s restaurants). Still in its ‘soft opening’ stage, the resort is scheduled to be completed by mid 2014.